If despite current events you're still thinking of picking up the Final Season of The Walking Dead, then as of today you might find this difficult, as Telltale is currently de-listing the product from all storefronts. Techraptor initially reported the discovery, which was made by Twitter user Pixelburst. It appears the beleaguered company has removed the game from sale on various storefronts including Steamand GoG. The latter’s store-page for the Final Season now reads “Coming Soon” while the former only offers a downloadable demo of the Final Season. Pixelburst also observed that Episode 2 is still listed for people who own the Season Pass. At the end of last week, Telltale announced it was laying off all but a handful of its current staff. As for the Walking Dead: The Final Season, its future remains uncertain. 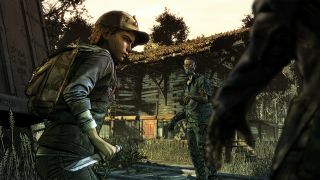 The company, or what’s left of it, has tried to reassure Walking Dead fans that hopes of completing the series remain alive, as they are sourcing “multiple potential partners” to help finish off the series. But both designers and actors on the series have questioned the likelihood of this happening. Given that Telltale still can’t confirm whether the Final Season will be finished, de-listing it from sale is a sensible move. If it turns out completing the season isn’t possible, then the last thing Telltale surely wants is to generate more bad blood by having sold additional copies of the game while its future is in doubt. Nonetheless, it also doesn’t bode well for Telltale's confidence, while the lack of any notification that this was going to happen isn’t a good look for the company either. I can understand that the execs want to salvage something from this mess, but frankly I’m not sure I want to play a Telltale series almost entirely created by outsourced partners. Ultimately a developer is defined by the people who work there, and nearly all of those people who made up Telltale are no longer at the company.